Bentley V's Story . . .
Update 04/12/2013: "With his heartworm treatment complete, Bentley is enjoying being off activity restriction and is now taking daily walks." With his heartworm treatment complete, Bentley is enjoying being off activity restriction and is now taking daily walks. His teenage pal has walked him down to the neighborhood creek where Bentley was introduced to the joys of wading and lying down in the cool water. Although he had to be coaxed in, Bentley appeared to enjoy this new activity. He currently has no diarrhea after a second round of medication was recently completed. He is, however, continuing to be fed kibble which supports GI health, along with a chewable probiotic, for a while longer. 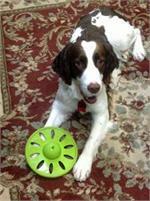 A fun-loving guy, Bentley enjoys having toys thrown for him which he returns for more fun. Sometimes he drops the toy and other times he likes them to be semi-wrestled from his mouth for the fetch game to continue. His foster family uses the command "give" to encourage him to drop the toy, but he hasn't had the light bulb go on just yet. Toys can be fun just for chewing, too. Bentley will contentedly lie down at his foster mom’s feet and chomp on his rubber chicken. When told to “sit,” Bentley displays a fine sitting posture. He also sits nicely while waiting at the door to get his leash on and while his food bowl is being lowered to the floor. He knows “down,” and will "down" nicely for a microsecond or three. Bentley walks very nicely on the leash because his foster mom puts him in a harness for walks. Barring a squirrel sighting, he does lots of circling and the usual zig-zagging, but no yanking on the leash. He has cautiously met other people walking; he sniffs them and allows them to pet him. Other dogs have not yet been encountered on these outings. Some behavior that needs shaping is Bentley’s persistent barking while anyone is at the table eating. This occurs even though he has never received any food from the table. When he is ignored, he often begins pawing at those eating. His foster family uses the command “no,” instructs Bentley to sit, and praises him for sitting. When they begin to eat, the barking starts up again. Removing him to his kennel usually resolves the barking; he might bark briefly, but then settles down. Bentley also barks and paws at people when he wants attention. He sometimes will be a little mouthy, pulling on clothing or hands if ignored; but he can be redirected to "go find a toy,” which is usually what he wants to do. If he does not want to go to his crate, or go somewhere towards which he is being directed, Bentley balks and gives a grumble and a bit of attitude. At this point, if one leaves him, gets a treat, and says “kennel,” he will run there. This is behavior which will need additional training to eliminate. On the plus side, Bentley barks to indicate that he needs to go out and will go to the door if asked "do you need to pee?" He has no problems with grooming or handling any part of him, and he loves being petted or receiving a nice massage. Additionally, Bentley does not get into garbage, although he would be happy to raid anything left unattended on a counter! He hasn't had much success, but that is probably due more to the fact that the resident Springer is a cunning and shameless counter thief, so all surfaces are policed routinely. Bentley can be trusted to have free roam of the house when the family is home and is crated when everyone is gone. He very willingly enters his crate when offered a treat, and sleeps with his parents in a bedroom crate. He has a larger kennel that he hangs out in while his family is in the TV room. Bentley is a fun-loving guy who just needs the love, attention, and structure that a special family can give him. 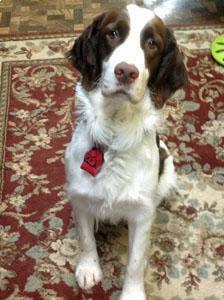 While he works on becoming the best Springer boy he can be, watch for more news on Bentley’s progress. Update 03/0720/13: "Due to the heartworm treatment, Bentley is restricted to crate rest." Bentley had his remaining two heartworm injections without any serious complications, although this round of treatment definitely took the wind out of his sails. The poor boy was pretty wiped out and developed diarrhea that lingered a few days. The vet felt that it was the result of the injections plus the stress of spending a few days at the veterinary hospital. Bentley has begun medication and – every Springer’s nightmare – had food withheld for 24 hours. His foster mom began reintroducing solid food with bland rice and chicken. So far, Bentley’s tummy seems to have calmed down, and, his foster mom will begin adding his kibble slowly over the next few days if he continues to do well. Due to the heartworm treatment, Bentley is restricted to crate rest. His foster mom is certain that he’s baffled by his confinement, wondering why his family won’t throw his beloved toys for him to chase. Prior to his treatment, Bentley was still demonstrating occasional resistance to the commands of the males in his foster home. Once his crate rest is complete, more work will be done to shape his behavior to include compliance with all members of his family. Taking it easy isn’t all bad for Bentley, since his foster mom allows him out of the kennel for some love and attention and quality TV snuggle time. Keep looking for updates as this sweet boy continues his journey to excellent health. Update 02/12/2013: "His foster family finds this youngster to definitely be the 'strong-willed child.' "
Bentley’s housetraining has been taken to a new level, to ready him for crate rest during his heartworm treatment. It has been a process to get him to "do his business" in the home yard. He was sure he could only do it while on a walk. It has seemed a contest of wills but, he has, in the last week or two, come around to the idea that leaving home is not always necessary for necessities. Speaking of will, his foster family finds this youngster to definitely be the "strong-willed child". As is typical of pups, he likes to test pretty much every boundary and then test it again! He will put his paws up on the counter or table to see what's going on, gets told "off", is removed, then does it again, and again. He's not trying to get anything in particular; he just wants to participate in activity up there. He doesn't like the spray bottle he gets in the face for it, but will take it for a good half minute before he moves……what a determined scamp! To his credit, Bentley doesn't trash dive. Notable progress on one front…………Bentley has improved from checking every day to see if the rules have changed about getting on the bed to checking a couple times a week! Good boy! Though more cautious of men than women and girls, Bentley is perfectly happy to couch snuggle with his foster dad and the teenage boy in his home. He continues to display puppy-like manners when excited. He will leap at people he’s greeting or if there is something they’re holding that he might be interested in………think toys, sox, leashes, coffee mugs. His foster family is working on this with him but when he is feeling exuberant, Bentley can do a standing leap of close to a yard……what athleticism! Commands are coming along. Bentley does an excellent “sit”, has almost mastered “down” and is very consistent on "shake.” He’s working on "give" also, to learn to release something from his mouth. At times Bentley will break into barking when his family is eating, so he occasionally requires a "time-out" in his crate; then this smart boy settles down nicely. Bentley stepped out for a professional grooming recently and was reported to be shy about the clipper noise, but not ill-tempered in any way. He was fine with having his feet handled and is now a very sleek young guy indeed…… :). He loves being petted and getting a mini-body massage. Update 01/14/2013: "A pretty verbal guy Bentley barks to get attention for playing and when the family is sitting at the table for meals." Touching base with Bentley, he continues to be a busy young boy. He hasn't had any accidents for over two weeks (yea, Bentley! ), although he has as yet no real definitive "go out" signal, just increased restlessness that one needs to tune into a little. His family has figured out that he likes to (read: almost stubbornly holds out to) do his business on a walk after eating. Other basic training is progressing steadily. This pup is jealous of attention, pushing himself between the resident senior dog and whoever is the attention-giver. He persists with trying a few times a week to join the resident dog and his foster parents on their bed and needs to be directed "off". He never gives his foster mom trouble with this, but has given his foster dad the snarly lip twice when he directed him………don't know if it's the deeper voice, the dark, or that his foster dad is 6' 2", or all of the above. Both times his dog-savvy dad let his foster mom tell Bentley "off" and he jumped down. A little dominance tendency may underlie this behavior as well as those little toy and jealousy moments. Bentley has never otherwise been snarky. With good consistent training to learn who is in charge, this youngster is poised to do really well. A pretty verbal guy Bentley barks to get attention for playing and when the family is sitting at the table for meals. When he becomes insistent and begins putting his front paws on the table, he gets corrected with "off"; if he continues, he will sometimes need some quiet time in the crate. There he will bark to complain but does quiet down minutes later. Bentley also will jump at people and try to grab at their clothes (with their body parts in them: 0 -yikes); he will go for what someone may have in their hand if he thinks it's a toy or food. To counter this, he’s learning "no-off”, and is rewarded with a dog toy once he sits. Bentley does well with the resident cat, age 15, who is not particularly nice to dogs, depending on his (the cat's) mood. He mostly ignores the cat and can be in the same room without problems. Though restricted to mild activity until his heartworm treatment is complete, Bentley is walking in his yard several times a day and around the block twice a day on leash. He walks without excessive pulling and mostly ignores other dogs passing by on the other side of the street. He was lucky to meet a family friend for a walk together with her beagle. Bentley was unfriendly to the beagle at the outset, but settled into the “ignore” mode, so long as the beagle didn't try to be in his personal space. Original: "Bentley is an affectionate, busy one year old with typical puppy mannerisms." 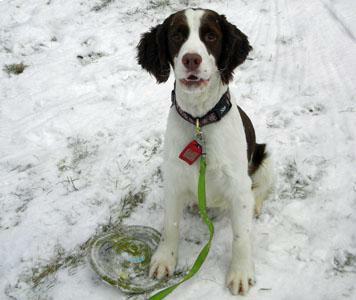 When a Good Samaritan from North Carolina found this one year old, stray Springer puppy, she gave him to the shelter where staff members quickly contacted MAESSR for assistance in placing this cute pup. Thus, Bentley became a MAESSR boy! 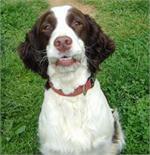 Bentley is an affectionate, busy one year old with typical puppy mannerisms. Chewing and puppyhood go hand-in-hand, and Bentley will chew (or really de-stuff) any soft toy over time and loves doing it! He has nibbled holes in the dog bed cover while lying on it, too. He has not chewed any non-dog items, though, except empty paper towel rolls that were left on the floor. Chewing on hard rubber toys feels good, so Bentley especially likes his Kong and hard rubber squeaky toys, the louder the better! As curious puppies often do, Bentley has put his paws up on the counter a couple times to see what's going on if someone is working at the counter, but will remove them when told “off.” He doesn’t seem interested in countertops otherwise and he has left the trash can alone. Good boy, Bentley! Adapting quickly and well to life in his foster home, Bentley he follows the weekday family schedule: feeding and going outside early with his foster dad, then having another outside break before crating for eight to nine hours till all get home again. This good boy has had no accidents in his crate on workdays. When his family is home and he is not in his crate, Bentley's housetrained status is "not entirely there yet." He has had several accidents in the house despite being taken out every couple hours and he doesn't yet have a clear "go out" signal. His foster family is giving Bentley lots of praise for his success outside and with their consistent training efforts, he should soon get the idea that outdoors is the proper place to eliminate, not inside! Bentley really wants to please his humans, a factor that will hasten his success, too. At night he sleeps on a dog bed beside his foster parent's bed and is fine until morning. He usually attempts a few times to join the resident Springer and his foster parents in bed, but will then accept staying on his bed for the rest of the night. Bentley loves attention and loves being wherever the family is. His foster family’s children are now teenagers and so far he has not met people younger than that. 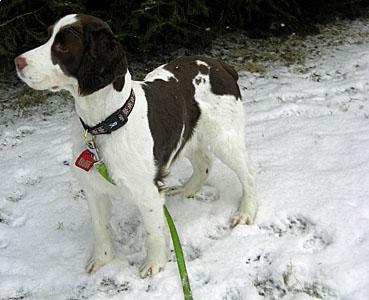 Four-legged foster family members include an eleven year old male Springer and a fifteen year old cat. Bentley is interested in the cat, but will back off when told “no.” To ensure the safety of the cat, his foster family has not given Bentley free access to her. (The Good Samaritan from North Carolina reported that Bentley was good with her cats and dogs, though.) Generally, Bentley gets along well with both. He and the resident Springer lie quietly together, walk nicely together and move around the house together without issues. They are fed at opposite ends of the same room, though, just to make their eating issue free. Bentley has no food aggression with people. His foster parents can reach down and take his dish while he is eating even though he will continue eating out of it while they are doing so! An excited and enthusiastic eater, Bentley is making progress with sitting and waiting for his dish to be ready. What a smart pup! A bit jealous of the resident Springer at times, Bentley sometimes darts at him if he thinks the resident is getting all of the attention. He gets corrected for this and there have been no fights, just snarkiness. Since Bentley loves all toys, he does guard them from the resident Springer, giving him the curled lip and sometimes darting at the toy if the resident dog has it. Again, there has been no fighting and Bentley gets corrected for this behavior. 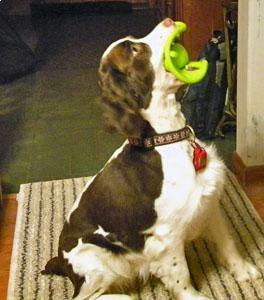 The humans can take the toy from his mouth, but he hasn't learned yet to release it with a command. His foster family will be working on this with him. When his foster mother picked him up in Virginia and drove him to her home in Pennsylvania , Bentley was an excellent traveler, sitting in the back of the car behind a dog barrier. He is also an excellent and solid sitter but will occasionally jump on people when they first come in the door. His foster parents are working on the commands “off” with him and then “sit" for attention. He really wants to please and is doing very well considering he’s been in foster care for such a short time. Bentley walks fairly well on leash without excessive pulling, but sometimes tries to grab the leash with his mouth, thinking a game is in progress. He would like to chase the squirrels, but has not been off leash with his foster parents. When on the long leash outside, he has explored a little, but has been mostly content to just hang out with his family member. Please note that MAESSR only places puppies in homes that are committed to training and bonding with the pup in obedience classes. Puppies require a lot of care, attention, and patience, and they do chew on things! The decision to get a puppy and raise it to be a healthy, happy, and well-adjusted dog is a serious commitment. To reinforce this commitment, MAESSR requires all adopters of dogs one year old and younger to enroll their puppy in an obedience class within 60 days of adoption. Little Bentley was not enamored with having his coat clipped but tolerated the procedure with aid of his foster dad. He had no problem with scissor trimming or with having work done with his feet, though. Bentley seemed to enjoy being brushed since it meant getting more attention, yea! Although he has not had his nails trimmed yet, his foster mother has cleaned his ears without any problem. Also, he was a model puppy at the vets, loving the meeting and greeting there! Bentley can’t wait to have his own forever family who will be dedicated about continuing his training and giving him all of the love, attention, and exercise he needs! He would do best in a family with older children since, at least at this stage, he still needs work with not jumping up to greet people or to grab at items and until he is less possessive about "his" toys. Bentley will be a wonderful addition to some lucky family!